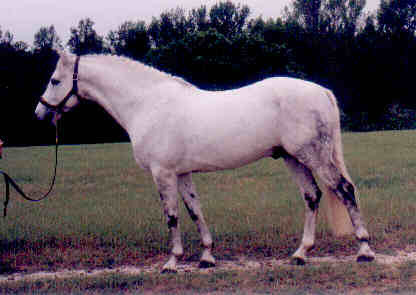 Cassi's sire and dam were both inspected and approved by the ACPS in October 1995. 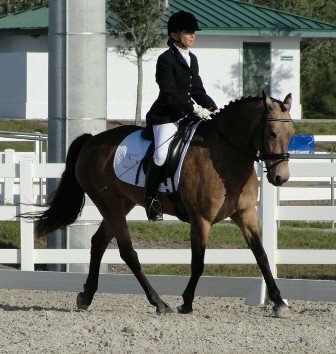 Cassie (Balmullo's Cassiopia) successfully competed in the United States Regional Dressage Finals in Training 4 last weekend in Atlanta. Our finals score was 64% which put us 12th in 28 competitors. She acted like a champ, focused and calm as always! Trip up to Atlanta had 3 blown tires in my trainer's rig!! 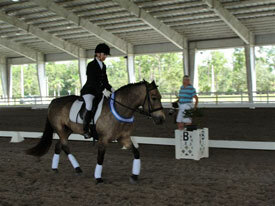 Cassie and I competed in the Wellington Dressage Opener/CDI this weekend. We got low 60's in Training 3 and First One on Friday but today got 68.8 % in Training 4 for our first qualifying score for this year. Judge was Lilo Fiore and her comments were "'Very obedient, precise geometry. Connection it's highlight also nicely shown bending." 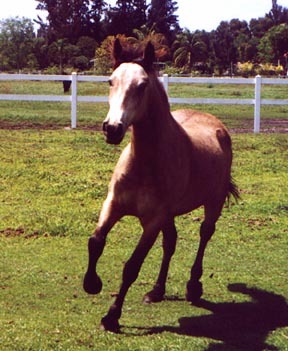 1998 Registered Connemara Pony. 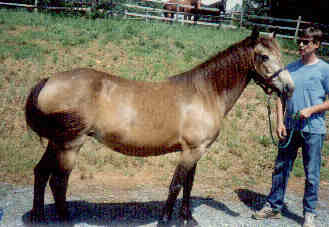 Mare with Permanent Pony card at 141 7/8. 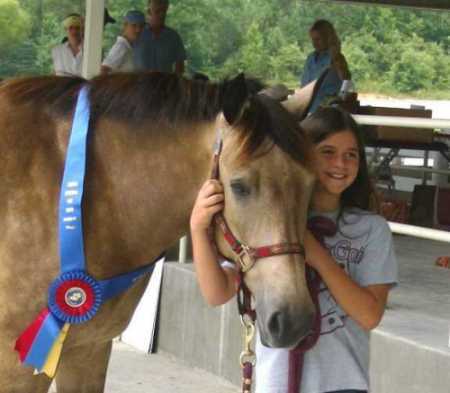 Proven show pony with a Region 4 Performance Championship with the Connemara Pony Society. Eligible for large green pony. 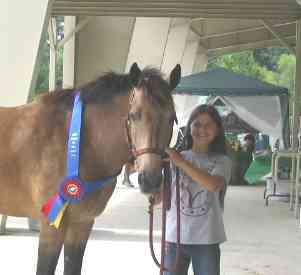 Cassie has numerous championships in the local show circuits. 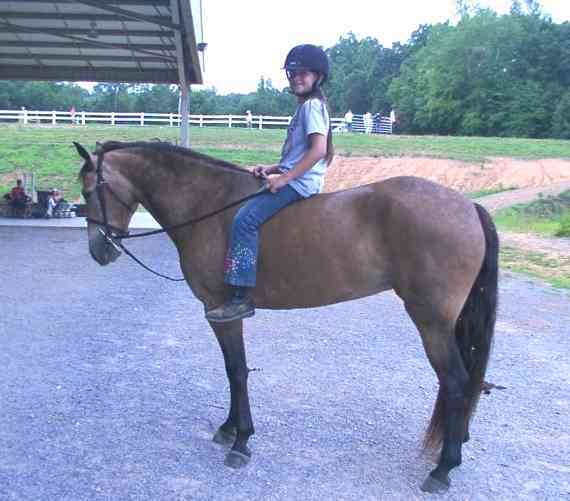 She has been shown in everything from short stirrup to childrens horse/pony at 26. 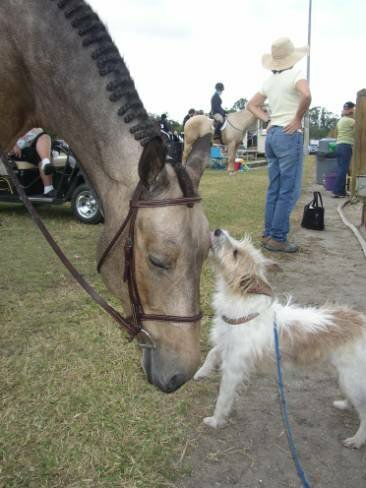 Cassie excels over fences and is very competitive in every thing we have asked her to do. 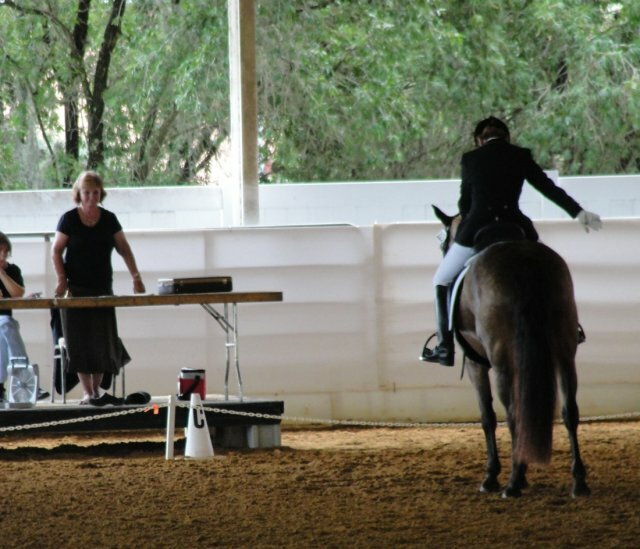 She has even shown English pleasure and equitation, as well as trail classes (in english attire). Cassie has auto lead changes. She stands quietly for clipping, braiding and farrior. By the way, she is barefoot (no shoes). Loads, trailers and ties easily. Cassie is very obedient and quiet. We cannot say enough good things about her. You couldnt ask for a sweeter, quieter pony. 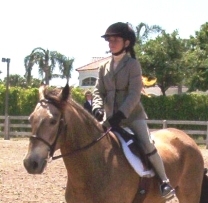 2005 Palm Beach County Horseman's Short Stirrups Year-End High-Point Champion. 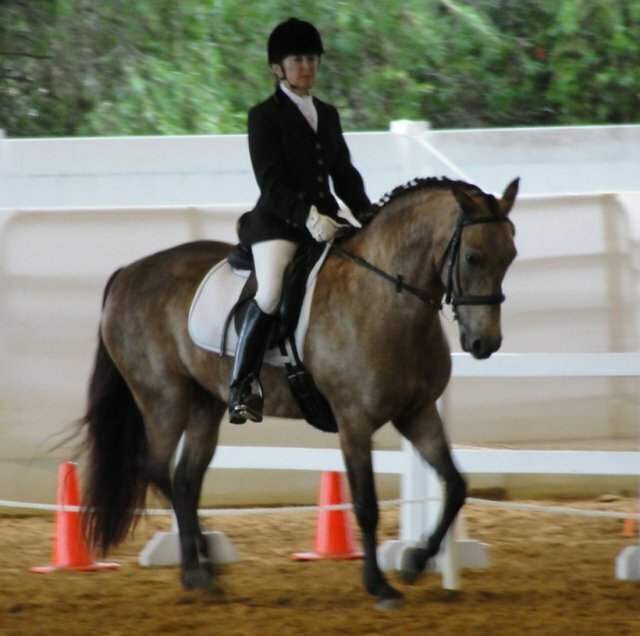 Cassie's form and quiet athleticism come naturally, causing her to shine in the show ring. 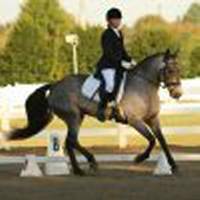 While her natural form and style make her a winner at horse shows, her true value comes from her sweet, gentle demeanor both on the ground and under saddle. 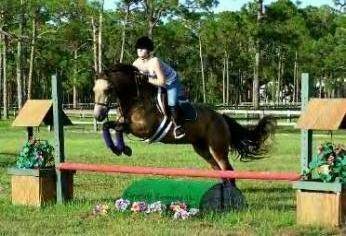 Cassie is extremely versatile and aware of her rider's capabilities, she can go from teaching lessons with the most basic beginners to performing a perfect hunter course of 3' fences--just point and shoot! 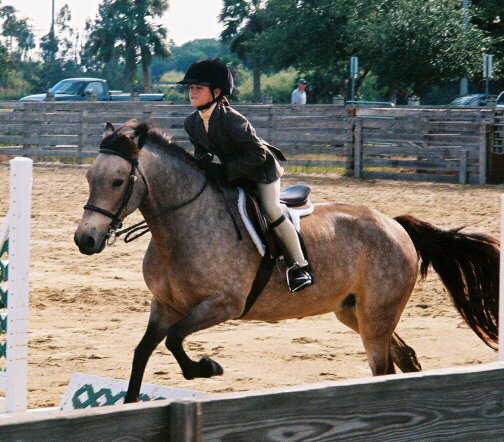 This is a safe pony a young rider could grow up with and learn from. Loving and kind, Cassie absorbs attention like a sponge, giving nuzzles and sweet breaths in return. Not at all mare-ish; Very patient and quiet on the ground; clips, crossties, trailers. Young and old; everyone who meets her falls in love! 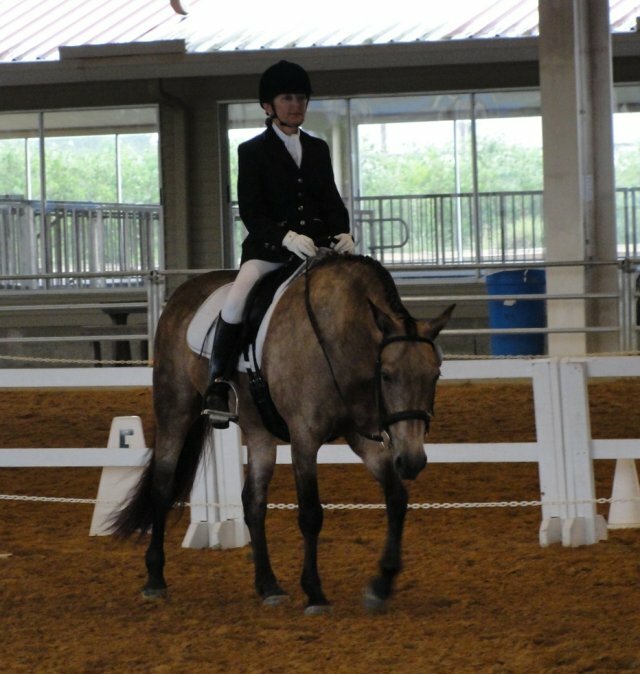 ACPS Region IV Connemara Performance Champion - Balmullo's Cassiopia, owned by Michelle Damon, ridden by Marissa Damone (FL); Marissa earned ribbons in Hunter Ponies US, Hunter Ponies OF 2', Connemaras US, Connemaras OF 2', Open Hunters OF 2', Connemaras OF 2'3" and they were 3rd in the Pony Jumper Stakes! 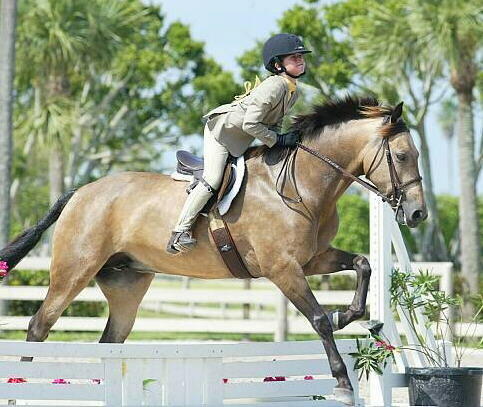 Marissa Damone won all of her Short Stirrups Equitation Classes plus a Medal Class for a total of 4 Blue Ribbons this weekend (4/23-24/05) in Wellington, Florida at the Palm Beach Horseman's Association which is endorsed by the USEF. She was Grand Champion. The day before in the Hunter Short Stirrups. Marissa and Cassie took Reserve Champion. Jan Westmark sold her Connemara mare, Balmullo's Cassiopia (Balmullo's Beacon x Blue Hills Morning Star), to Michelle Damone. 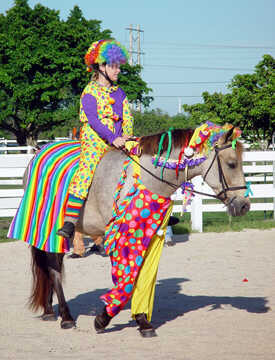 Right now Marissa and Cassie (pictured below) are on a "Preshort Stirrup" circuit and are doing quite well. In January, they were Grand Champion and in February, Reserve Champion in the same circuit. I am looking forward to meeting them at the Region 4 Connemara show this July! "When I heard about Cassie I knew I would buy her even before I saw her. She was a yearling, a bit scrawny and had lots of quirks, but she has grown into a pony that will give me years and years of enjoyment..." Jan also went on to buy Cassie's half sister Balmullo's Winsome Sky, a purebred four year old dark bay pony. In the above photo (top of page) of Abby jumping Cassie Jan said, "It takes my breath away because Cassie jumps just like Shillelagh did. After she is done jumping she stands in the middle of the ring and closes her eyes and goes to sleep. That's a Connemara for you, and she is only four years old!!!" 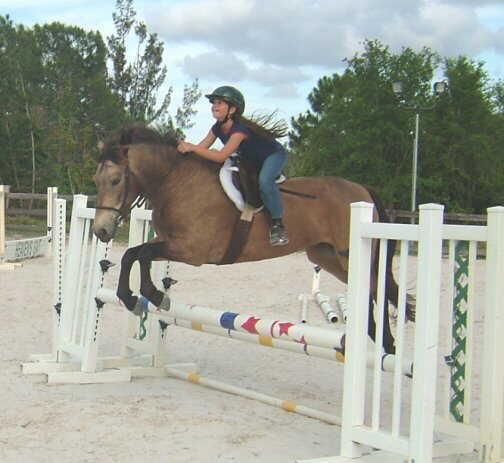 Congratulations to Jan Westmark, Davie, FL on her purchase of Balmullo's Cassiopia!